Things that Damage Catalytic Converters! In this post are 7 things that damage and shorten the lifespan of the catalytic converter in your vehicle. Catalytic converters have been around as a result of stricter emission laws originating from California. Combustion in the modern engine produces harmful hydrocarbons (HC), carbon monoxide (CO) and oxides of nitrogen (NOx) due to incomplete combustion. This is where cats come in, to make right this wrong. Catalytic converters are usually made of a honeycomb ceramic or metallic substrate to which the following catalysts; platinum, palladium and rhodium are applied. These are precious metals and explains why catalytic converters are expensive! Beware if buying a used car and it has a check engine light, amongst other things, make sure the catalytic converter has not been removed! Some mechanics will even steal catalytic converters from cars whose owners simply drop them off for repairs. The function of catalytic converters is to catalyse the reaction between HC & CO to form harmless carbon dioxide and water. The water explains the mist that comes from an exhaust pipe on cold mornings. It also converts the highly poisonous NOx to safe nitrogen at temperatures between 260oC – 430oC. A Catalytic converter with heat shield off. An oxygen sensor is attached. 1. Thermal shock: As previously stated catalytic converters run at very high temperatures and thermal shock will occur when a hot catalytic converter is driven through deep water. The casing of the converter shrinks at a much faster rate than the substrate compressing it. 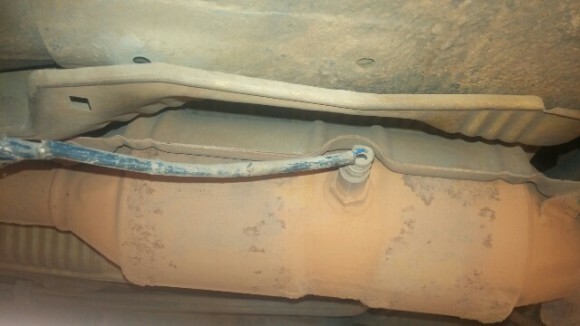 If shocked enough, the substrate fractures and can lead to the blockage of the exhaust. So if you have a choice and an alternate route exists, don’t drive through deep puddles of water! 2. Physical damage: This is principally caused by driving over bumps or potholes in such a manner that dents result on the converter casing as it impacts with the bad road or other objects. These dents if bad enough can fractures the substrate, compromise its functioning, and lead to blockages. I sometimes shake my head as I watch a particular neighbour drive his car almost without care over a high bump in our neighbourhood. A simple “C” movement over the bump will prevent the exhaust system from scraping the bump! 3. Leaded fuel: Lead destroys the catalyst. This may not be an issue in countries where leaded fuel is banned and good quality control mechanisms exist. However some countries still have poor quality control mechanisms and adulterated/leaded fuels persists. Ensure you only get gas from verified gas stations. 4. An engine running rich: This simply means that there’s more fuel in the air-fuel mix entering the combustion chambers. As a result unburned fuel exits the combustion chamber into the catalytic converter and increases the operating temperature beyond design limits (750-800oC). This melts the substrate. Conditions that can cause an engine to run rich are fouled spark plugs (will cause engine misfires), leaky fuel injectors etc. As a note of warning; if you have flashing check engine light (CEL) it means a condition damaging your catalytic converter is occurring i.e. unburned fuel is being dumped into it. You should have this fixed ASAP. 5. Exhaust leaks: Akin to the running rich, pre-catalytic converter exhaust leaks lead to more air going into the hot converter. Just like fanning embers make them glow hotter, the non-metered air will raise the temperature of the cat and lead to melting of the substrate. 6. Fuel additives: (e.g. injector cleaner): Some of theses contain compounds that damage catalytic converters. If you must, ensure the label of the additive says catalytic converter safe. 7. Contamination: This can be by oil or coolant if you have a worn or leaky head gasket respectively. Both will manifest as white smoke from the tailpipe but the one caused by oil will have a bluish tint. Once the functioning of catalytic converters is compromised, you develop a “catalytic converter below threshold” code. Commonest is the P0420. Help keep you cat healthy!